Are our Brains Being Rewired? "Dazzled by the Net’s treasures, we are blind to the damage we may be doing to our intellectual lives and even our culture" Nicholas Carr writes in his latest piece in Wired Magazine on the impact of evolving technologies on our learning, lives and culture. "What we’re experiencing is, in a metaphorical sense, a reversal of the early trajectory of civilization: We are evolving from cultivators of personal knowledge into hunters and gatherers in the electronic data forest. In the process, we seem fated to sacrifice much of what makes our minds so interesting," Carr contends. Carr develops an interesting argument; one worth contemplating. There is a strong case to be made for managing technology as we do all the tools we have at our disposal. I'm not sure we as a culture, or as a society, have figured out exactly how to do that yet, especially with respect to emerging technologies and the sheer abundance of all kinds of information. We are a little infatuated right now, and our consumer culture is feeding the frenzy. There is something to be said for employing the classical tradition of balance. Reading deeply and examining books or comprehensive, thoughtfully developed and reasoned text will always be an intellectually challenging pursuit, and an absolutely essential skill. When compared to the cursory skimming of bits and pieces of data and text that Web 2.0 encourages and almost celebrates, it doesn't take one long to realize that much of what is happening has been fleeting; it can't be sustained as is and it will self-correct in time. What the impact of this "revolution" will ultimately be and what it will all look like on the other side, though, is anybody's guess. I do believe we are at the dawn of another seismic shift (See Empires of the Mind) in our culture, but I'm not sure I buy into all of Carr's argument. It's about 6:45 pm Tuesday and I'm enjoying the company of some 120 young alums in Hyman Hall, many of their teachers and the Class of 2011. Pictured here is Fr. O'Shea of the Passionists updating the boys on how the $33 thousand the Class of 2010 raised for disaster relief in Haiti last year has helped the lives of so many Haitians--people who the boys will never meet; but whose lives they have been changed forever. 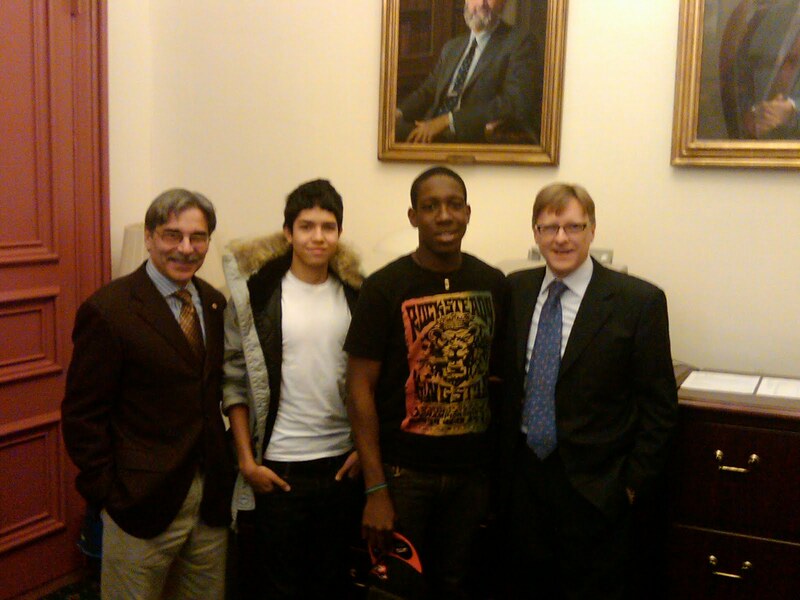 The boys represent leadership with a moral purpose. 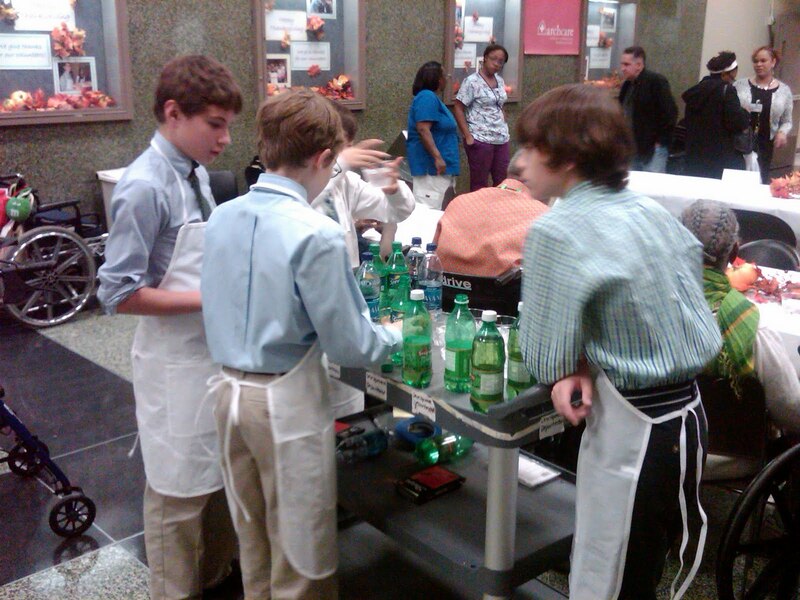 We are proud of their outreach and commitment to the greater good. 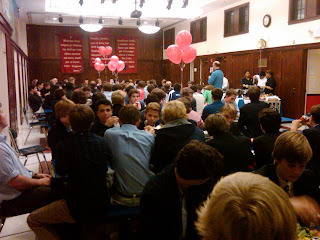 Homecoming dinner, a delicious meal of braised beef, mashed potatoes, a mushroom gravy served with lightly cooked fresh vegetables, fresh rolls and plenty of soda followed a visit to the newly furnished Faculty Lounge after Chapel--the Class of 2010's legacy gift to their school. It has become tradition at Saint David's to invite alumns from the last four graduating classes (high school alums) to the school on the Tuesday before Thanksgiving to enjoy Chapel and a meal with the Class of 2011 and their teachers--to share stories of high school, the application process and to prove that it really does all work out in the end. Chapel tonight was given by Keats Sexton, '01. After Saint David's, Keats attended Regis, Georgetown and now works for UBS. 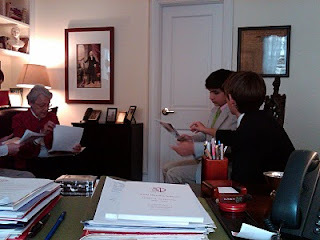 He reflected on the lessons learned at Saint David's that have carried him through all the years since, and shared two pieces of advice with the boys regarding their futures, namely: seize opportunities when presented and pursue your passions. Our gathering tonight of some 170 faculty and alums, all in a festive mood, happy to be back, reflecting, celebrating and catching up with friends is a testament to the importance of community. Tomorrow, one of the longest running and most anticipated of the school's traditions--the 45th Annual Odds and Evens Alumni and Faculty Soccer Game will be held. Evens (even year graduates) have managed to squeak out a victory over the Odds for the last seven years in a row. The odds may be on the Odds tomorrow. Happy Thanksgiving. 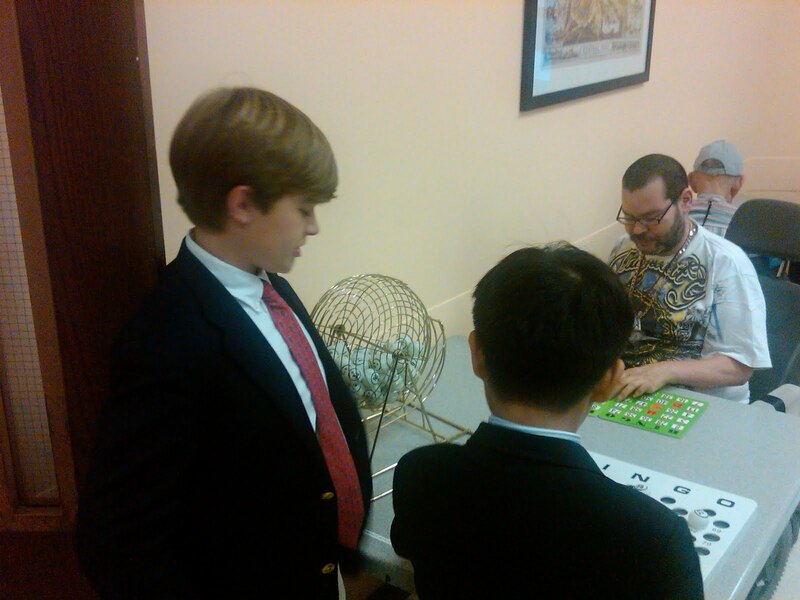 Thanksgiving festivities are in full swing at Saint David's. Late yesterday and early this morning some 8th graders were distributing pies to families in the Lobby while the rest were busy on the 4th floor packing some 200 boxes with cans and food stuffs collected from all the grades over the past several weeks, in preparation for delivery tomorrow, along with frozen turkeys, ham, and bacon, to Incarnation Parish on the West Side and Bethel Gospel Assembly Church in Harlem. Later this morning, I accepted an invitation to join Pilgrims (Omega) and Wampanoag (PreKindergarten) for their annual feast in the PreK room. They were fully decked out in costumes, all sitting at table enjoying the "fruits of their friendship." It was a wonderful treat. for family, for food, for freedom. friendship, love, laughter, health and hope. overcomes the many sounds of fear. have added to the quality of our lives and brightness of this Thanksgiving day. we are about to keep. The inspiration for this prayer is loosely based on one my daughter brought home from her school. The original author is unknown. 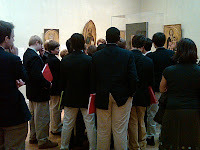 Following the Saint David's Pathway today at the Metropolitan Museum of Art, Eighth grade boys found themselves standing before Duccio's c. 1300 AD painting of the Madonna and Child--a 2004 acquisition by the Met for a mere $45 million. Holding her child gently in her left arm, Mary looks beyond her son with a palpable melancholy tenderness, while the baby reaches out his hand to brush the veil from her face. The formal rigidity and impersonal forms of Byzantine art give way in this piece to intimate gesture--the birth of a new way of perceiving and representing the world--a cultural transformation is underway in western art. Remnants of the Byzantine style linger for sure--in the gold background, Mary's elongated fingers, and the non-childlike child--but the colors of their clothing, along with the sense of intimate human interaction, leave us with the distinct sense that the two figures exist in a real space, and in real time. An analogue to the human experience, Duccio captures the emotional bond between mother and child and marks the dawn of a new era. Duccio is departing from pre-existing convention. He's challenging the accepted norms of his time. 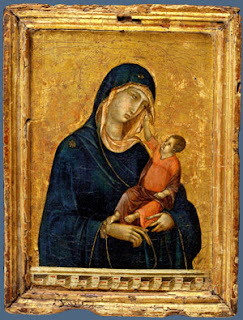 Considered the founder of Sienese painting, Duccio in Madonna and Child, defines a sense of space. By including a simple parapet wall along the base of his painting, Duccio separates the fictive world of the painting from the real world of the viewer. Art can do this. It has the ability to take us places far from our "real" world and yet help us see our own reality more clearly, more profoundly. True beauty lies in "truth" and we need art to help us see truth. As we contemplate this year of "The Aesthetic" at Saint David's, Duccio has a role to play. It shouldn't necessarily be this way, but the season for giving thanks has begun. I'd like to think we were forever thankful. However, this isn't a trait that comes easily to most of us, so a holiday season that encourages us to be thankful, for the blessings we enjoy, is the next best thing. 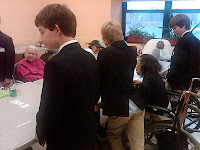 At Cardinal Cooke yesterday evening, Saint David's 6th Grade volunteers began the season by serving a Thanksgiving meal to the center's residents. With so many residents and so little space, Cardinal Cooke actually begins serving Thanksgiving Dinner to residents and their families this week and goes right on serving them all through next week. Pictured here are some of the boys working a drink cart after first creating a festive ambiance by decorating the tables with centerpieces and walls with Thanksgiving images. 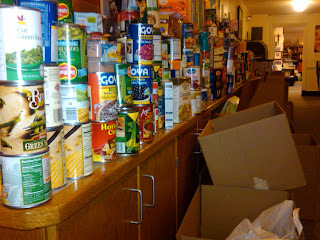 Meanwhile, back at school, the Class of 2011 with Mr. Ryan are busy coordinating the school-wide Saint David's Thanksgiving Food Drive, now in its umpteenth year. If you haven't yet, bring in those cans and dry goods boxes. Saint David's, through your generosity, manages to provide hundreds of New York City families a turkey and all the trimmings, ensuring they have a fully stocked table on the fourth Thursday of this November. We recognize and thank current staff and faculty members Jack Sproule and Tom McLellan for their service in the Vietnam War and to all our alums who have served and are serving and to those who have fallen. We are grateful for your selflessness. 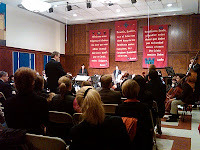 Van Cortlandt and Verdi--Does it Get Any Better? Saint David's Cross Country at Van Cortlandt Park is the photo at left. 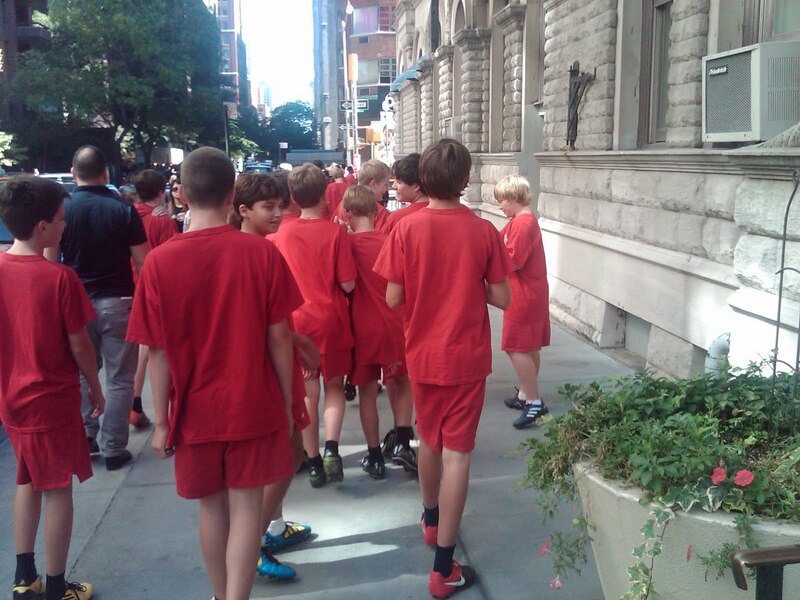 A growing sport of interest amongst the Seventh and Eighth Grade boys, eleven are here seen beginning their cross country run at the Manhattan Middle School League Championship meet late yesterday. After a grueling race, five Saint David's boys earned medals in this event: Blake K., Henry S., James W., Christopher W., and Henry T. And then, early this morning, 7:45 AM, several of these same boys were playing Verdi's Nabucco on strings at the Ensemble's Morning Coffee Concert for parents and families. Renaissance men in every sense, these young men managed to give virtuoso performances on and off the field. 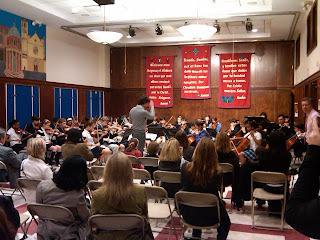 Van Cortlandt and Verdi. Does it get any better than that? ... of a B Minus," Wendy Mogel's newest book challenges parents to examine their true goals and aspirations for their children, especially their teenage children. Are our actions, our attempts to protect, support, and defend actually having the exact opposite desired effect? 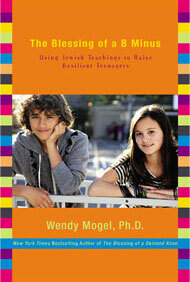 "We [parents]," Dr. Mogel says, "worship the idols of our childrens' happiness." We tend not to allow our children to fail, or to work through their problems. We want them to succeed, to not feel pain, to avoid the struggle, to be perfect. Parents, she says, intent on making their children happy, often rob them of the growth and maturity that comes with failure. We learn the most I think, especially about ourselves, not from our successes but from our mistakes, our failures. Food for thought and a book well worth the read. Space is a fascinating concept. I don't pretend to understand the full conceptualization of "space." What I do understand is that it is being redefined. Space for our children includes physical space, which we grew up with and are comfortable with, and a new virtual space, which for many of us is much less comfortable. This virtual dimension is as much a part of our childrens' worlds as the physical dimension is ours. This virtual space may bring with it many exciting possibilities. It also brings with it many daunting challenges. Our children are living now in this new space, a space that exists right before the present, just before "now." This is the space where they text, twitter, and update their Facebook pages; it's a space that is not quite synchronous to now -- it's "nearly now." This space is a difficult space to occupy. Children can be easily led to believe, or feel, they are safe, protected in this space. In Learning to Change, Changing to Learn, the Consortium for School Networking, refers to this "nearly now" space as an interesting space, a gentle space, one that can allow research, reflection, repetition, one that's not so pressured. Maybe this is so; however, I tend to think, especially because it is not defined, controlled, or protected, that this space has the potential to do great harm. It can even be dangerous. Learning to Change ... ends with a statement that we are seeing the death of education and the birth of learning. I'm not so sure about this either. There is no doubt that our culture is in the midst of revolution, similar, I believe, to the last great seismic shift (see Empires of the Mind: A Virtual Revolution), but as with the last revolution we will begin to organize and effectively control these "new tools" of the revolution, just as we did the new tools of the Industrial Revolution. It will take time though. Until we have effectively managed these new tools, we have to protect and safeguard our children. 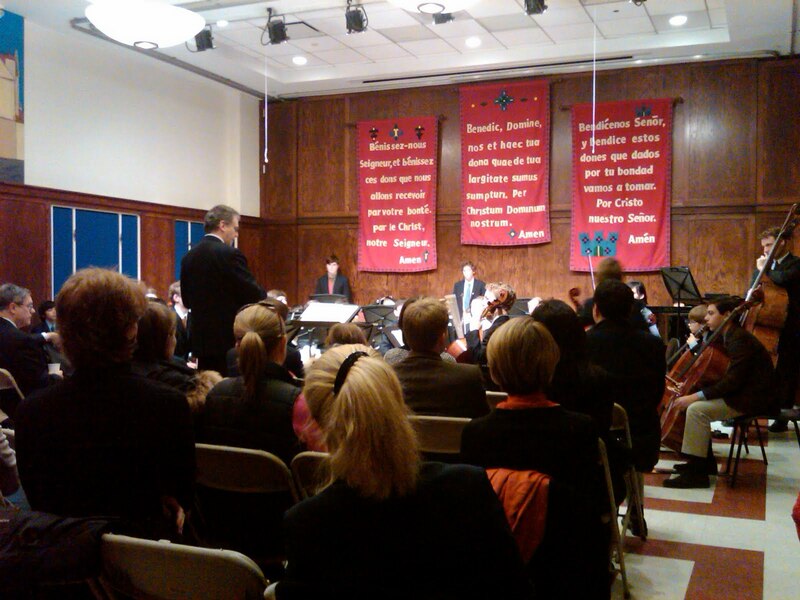 Schools have a responsibility to be counter-cultural institutions at times like this. The culture may be quickly moving in one direction, but is it the right direction? What are the true forces at play, driving all the different levels of change? We must critically evaluate what is happening, ask ourselves why and determine the importance. While we can't ignore progress and change, we can't afford to allow it to go unchecked either. 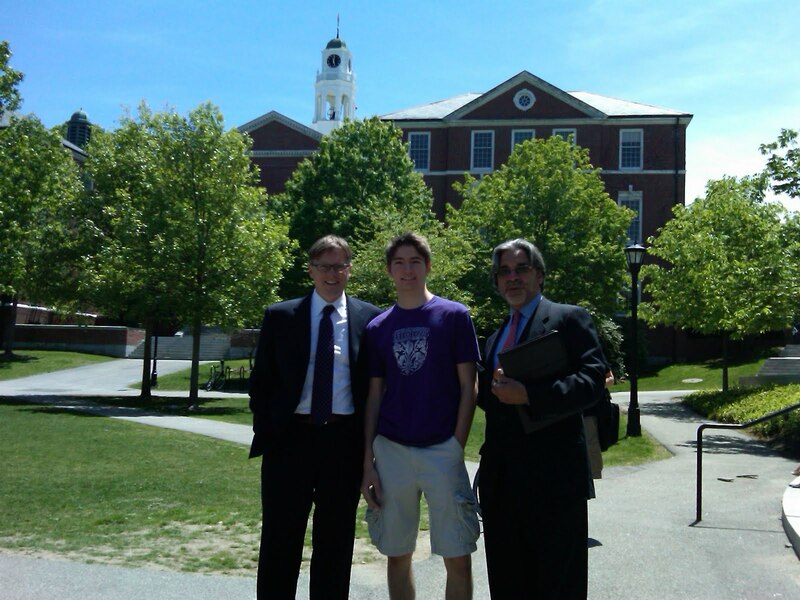 There are now countless examples, Choate being one of the most recent, where children are being harmed or harming. 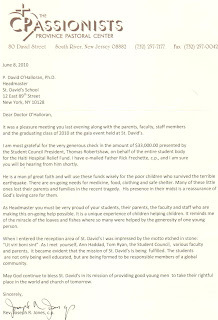 (Choate, by the way, handled the situation responsibly and directly). It is essential to critique and monitor, to be agents that effect positive change. Watch what your children are doing online, monitor their "virtual" social interactions as carefully as you do their physical ones. Educate your children about this "nearly now" and just how quickly, suddenly it can become the "now." They will not make that connection themselves. To them, it's private, protected; but we know it really isn't. For the past several years at Saint David's, as one component of our major Curriculum Initiative, we have been critically examining potential implications of the changing socio-economic-cultural landscape at the dawn of this new century. What may need to change within our curriculum to meet the demands of a new era? What should not? have been two of our essential questions. Ken Robinson is an internationally known speaker and thinker who comments regularly on the state of education, among other things. In his most recent talk, given at TED in February 2010, Robinson presents some provocative ideas on this very topic. Faculty were asked to watch and critique/react to the 18 minute talk. 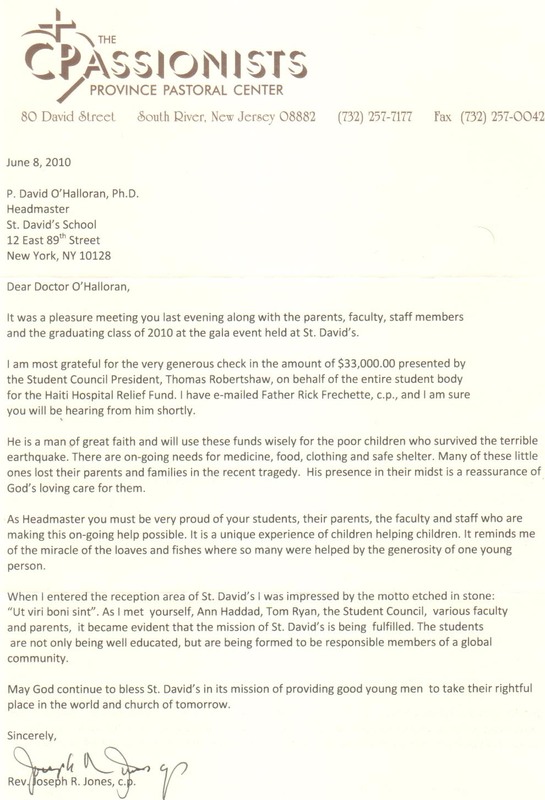 Within their response, whether they agreed with Robinson's underlying premise, or not, faculty were asked to explore potential implications for our Saint David's School mission and program moving forward? Responses were incredibly telling. We are a school in possession of a mission that is, clearly, fluid, flexible, and strong--flexible enough to respond to changing times, yet strong enough to stand the test of time. It was clear from the faculty's responses that, true to form, we accept the challenges ahead with a healthy dose of historical perspective and of current realities. There was an obvious respect for Robinson's "theory" and his educated speculation; but it was clearly balanced with a healthy degree of pragmatism too. I had the great pleasure of welcoming Lieutenant Governor Richard Ravitch and alums and friends of Saint David's to a private club in midtown for our Alumni Council's 4th Annual Networking Event. Loud applause filled the room when I informed the gathered alumni that I had just arrived from Randall's Island where Saint David's Red Baseball team managed to achieve a clear and convincing win against Allen-Stevenson, securing their claim to the league championship title. To top it off, they did so with back-to-back undefeated seasons, making this the school's third title in as many years. More applause followed. This was a great place to start the evening because the remarks that followed told a very different story. 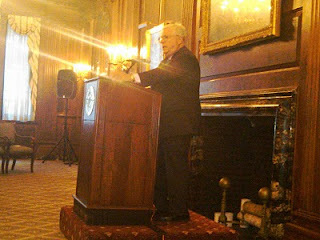 Lieutenant Governor Ravitch spoke directly to the failing economy of the state and the nation and the difficult nature of the road ahead. In sum, Mr. Ravitch expressed most concern about New York and other states' "disinvestment in higher education and state infrastructure," especially transportation, which he considers to be the very means for pulling ourselves out of the mess. Many current practices and habits, he said, will have to change dramatically, and painfully, before we see things truly improve. Even more concerning to the Lieutenant Governor is the country's negative and growing scorn of politics. At the heart of democracy, he said, lies politics. We can't have a democracy without it. The rhetoric of our culture, he passionately expressed, will have to change for a much needed new generation of leaders to enter the political process. 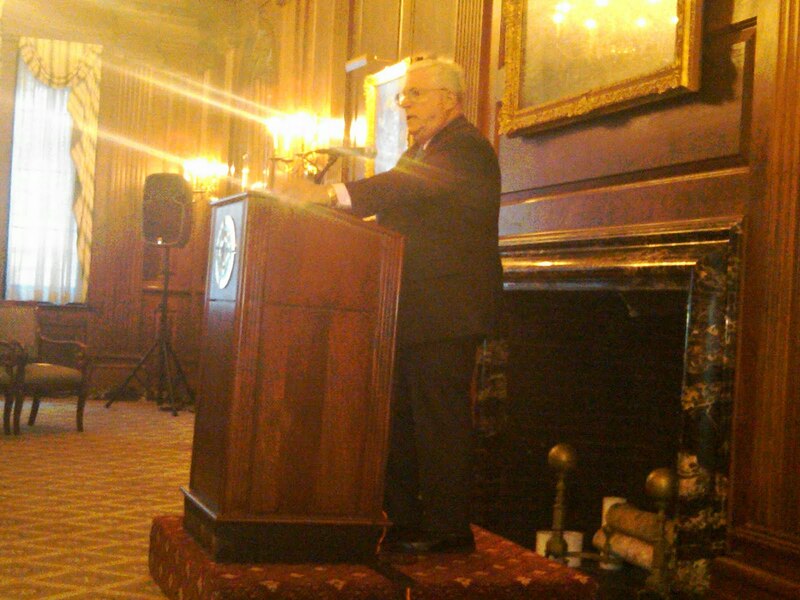 Mr. Ravitch graciously took a series of thought provoking questions from the audience. 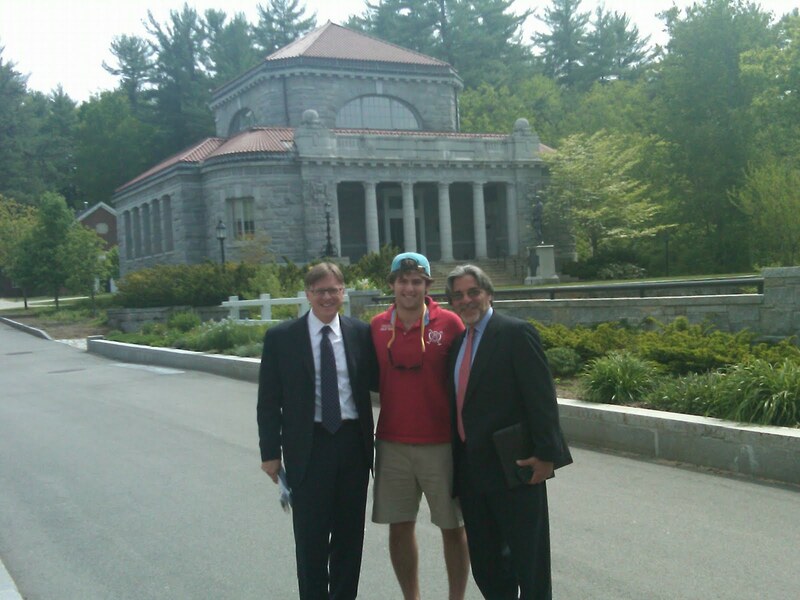 Under the leadership of David DeLuca '77, and with the support of Alumni Director John Dearie, the Alumni Council provided members of our extended community with a unique and intimate experience with one of our state's most important leaders. 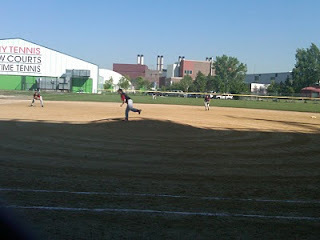 After a hit to center by Max C. Theo H. brings in Saint David's 2nd run at the top of 2. Then Max, after a hit, infield single to 3rd by Austin R., brings it home to close out the inning 3-0. Vinnie Boombats on the mound at the bottom of the first inning ... championship game against Allen-Stevenson. Score 1-0 Saint David's. Nick C brings in the first run. At Spring Concert this morning, 8th grade members of the Chamber Singers, James P., Dylan M., John V., Tommy R., Austen R., Max C., Vincent M., James L., and Andrew Turner, with special guest appearance by Jon R.! chose to sing "We are the World." Beautifully sung, the song captured the Class of 2010's special spirit. They truly have reached out and connected themselves to the world. 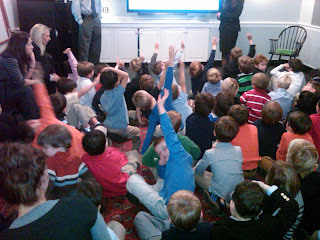 Always a generous class, having started the now traditional Pennies for Puppies program while 4th graders, through their incredible efforts this year with the most successful Thanksgiving Food Drive in the school's history and their Haiti campaign, the Class of 2010 has led the school in "making the world a better place"--the good at work. 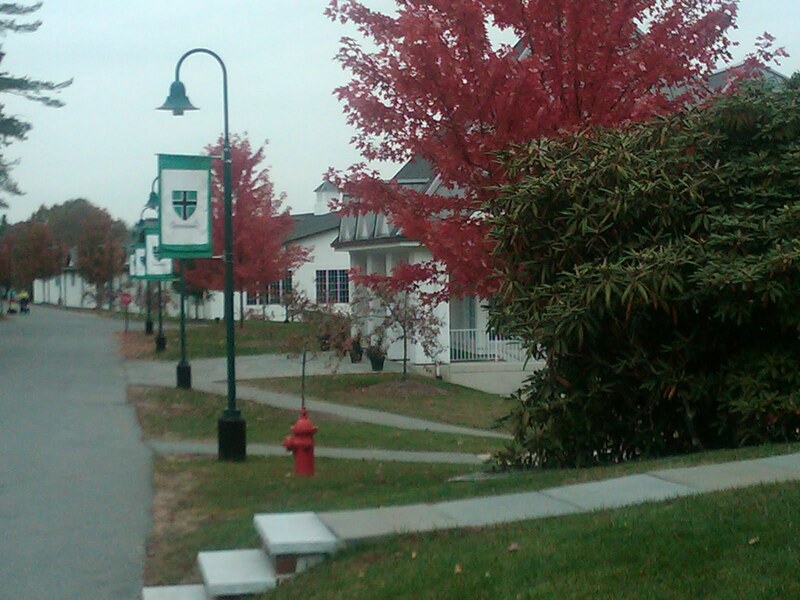 After Exeter, it was a quick drive north west to St. Paul's in Concord. 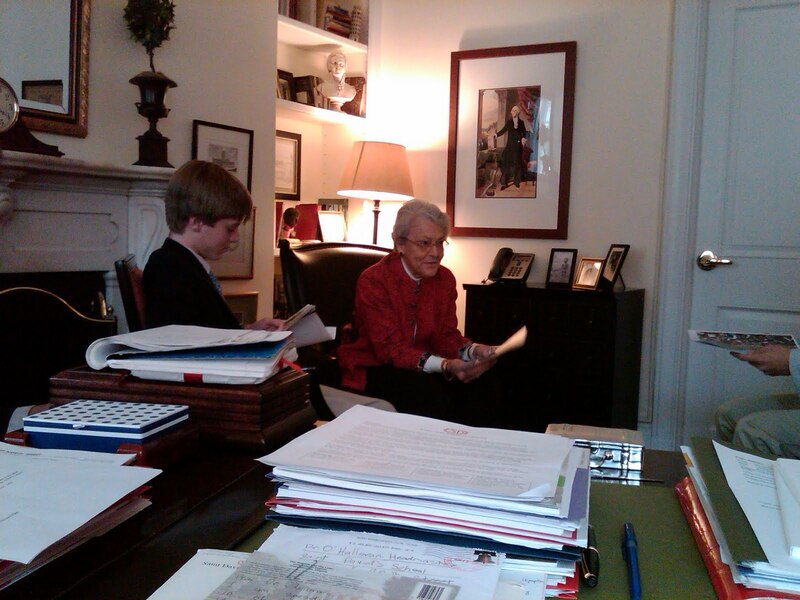 After a visit to the head and admissions director, it was off to spend some time with Browning P., second year. A highly effective tour guide, Browning has developed a singular reputation for impressing parents, their sons and daughters, with his knowledge and love of all things related to St. Paul's. 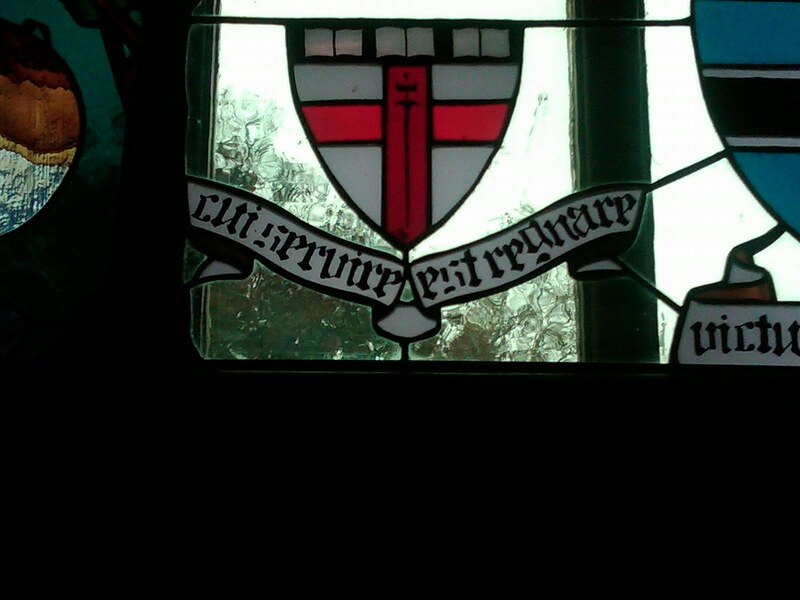 Browning was the consummate host, giving us a grand tour of St. Paul's campus and campus life. In keeping with New Hampshire's state motto, I'm working my way through "How the Scots Invented the Modern World" by Herman--quite a thesis statement, but a nice companion for the flight up and back none-the-less. Pictured are Browning with Mr. Imbelli and me in front of St. Paul's Library, by the beautiful pond. 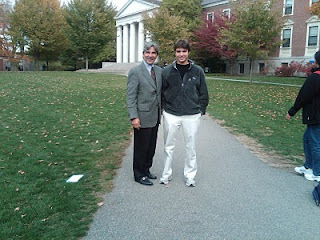 Flew out of LaGuardia early this morning with Mr. Imbelli for visits to Exeter and St. Paul's in Southern New Hampshire. Beautiful day for traveling to see alumni on my ongoing mission to visit all high school alums before they graduate high school. 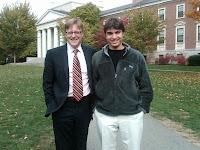 First stop, Exeter, to visit with Giacomo M., third year. 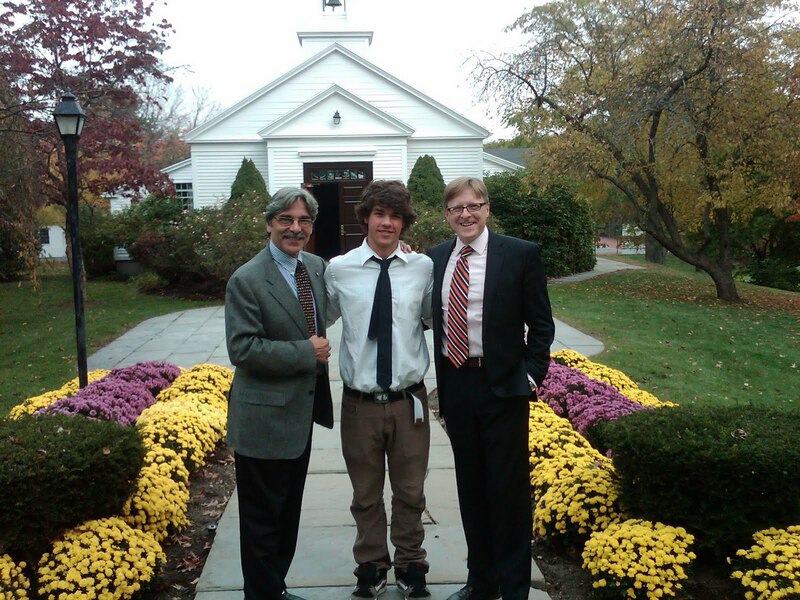 I met with Giacomo's headmaster while Mr. Imbelli met with the Admissions Director. 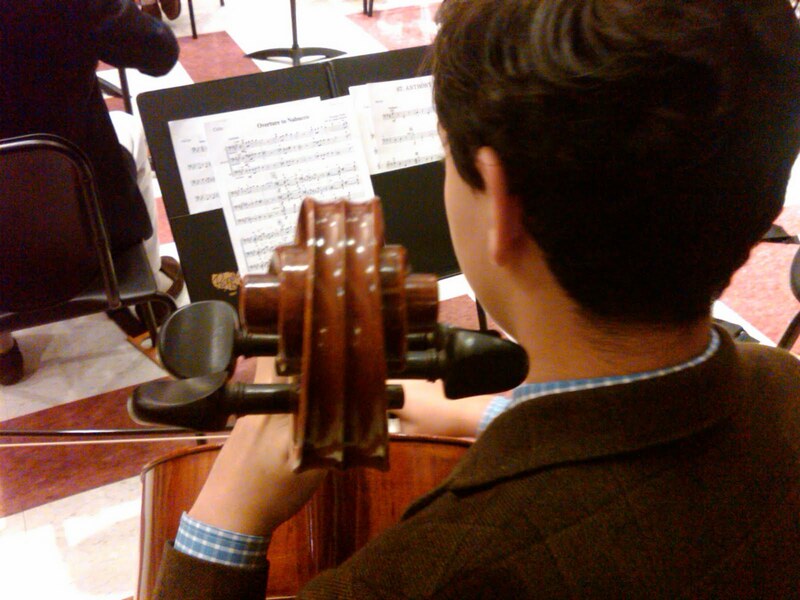 Giacomo continues to pursue his interests in math, science and music--his great passion. Giacomo performs in a jazz ensemble and is currently composing for the piano and orchestra. 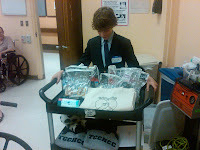 He is enjoying his experience thoroughly, even though this is his hardest term to date. 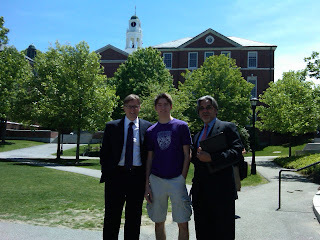 Pictured are Giacomo with Mr. Imbelli and me, in front of Jeremiah Smith Hall. We are so appreciative that Giacomo gave up a significant part of his "Headmaster's Holiday" to spend time with us. Right after this photo we left for St. Paul's. 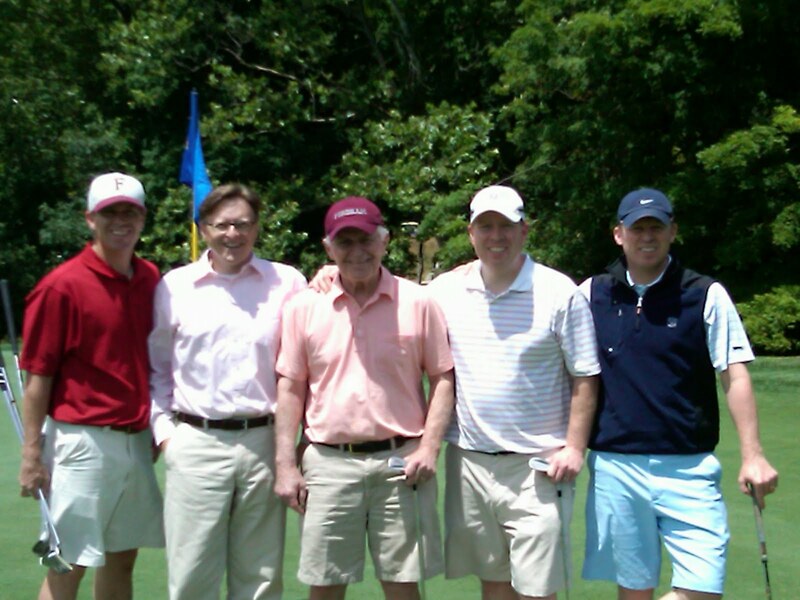 Friday evening, May 7, 37 of 40 alums from the Class of 1984 returned to Saint David's School for their class reunion. This was an unprecedented gathering. Traveling from Italy, London, California and Virginia, plus many places in between, these alums joined their former teachers for Chapel and a reception. It was an exciting evening of sharing stories and reconnecting with friends, and a testament to the strength of Saint David’s and her connection to her alums. Dr. Czuchlewski returned to give a very apt Chapel Talk, where he reflected on the different roles faith can play at different times in our lives. Many of the alums had not sat in chapel since graduating 8th grade 25 years earlier. It was an emotional experience. Following Chapel, the more than fifty guests moved to the Hume Library for cocktails. Several former and current teachers who taught the boys gathered for the occasion too, including William Cantwell, Paul Czuchlewski, George Davison, Michael Imbelli, Gary Kessler, Joe Kilkeary, Rovena Kilkeary, Robert McLaughlin, and Thea Osborne. 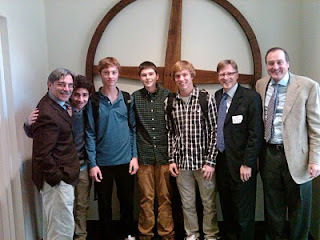 Superbly organized by Arthur Samuels III (Sam) '84 and Christopher Dorrian '84, and coordinated by Alumni Director John Dearie '95, the event could not have been more successful. Friday afternoon, May 7, after the boys were dismissed to their weekends, the faculty of Saint David's School assembled in the upper gymnasium of our 94th Street Gym for TfU (Teaching for Understanding) Expo. The culminating experience of a year's long work, the Expo was a celebration of teaching and learning by the faculty for the faculty. Arranged into 17 teams at the beginning of this school year, the entire faculty worked throughout the year to 'reversion' 17 units of study using a framework developed by Harvard University's Project Zero. Friday, each team set up their "booth" and positioned their displays and presentations synthesizing a year's worth of work. 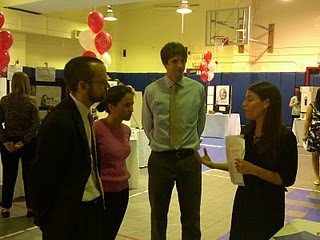 We then rotated, following a complex but effective system, though each of the booths to experience the work of our peers. 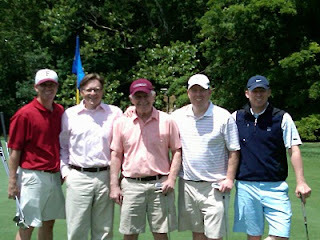 The atmosphere was electric and the camaraderie of the group unmatched. ... that one is visited by a contra-base recorder. Recorder teacher Susan Iadone, in preparation for a recital with the boys this coming May 27th, visited my office today with her contra-base recorder. Weighing some 35lbs and standing 10 feet high (the base part of the recorder is not pictured), the recorder, one of very few in the world, is made of Rosewood; it's also worth a pretty penny. Being a lover of wind instruments this was facinating. At First Communion last Friday for the Second Grade, I noticed a beautiful dress worn by the sister of one communicant. Midnight black with red trim, the dress was covered with Chinese characters, off-white, each approximately one half inch in height. Its unusual, unique style was quite stunning to look at. I examined the dress from a distance trying to determine whether the characters printed on it repeated themselves suggesting a repeating phrase of some kind; or not, suggesting a story or extended message. Or were they just graphic images for decoration? I decided to approach the 10 year old and introduce myself. I asked about the dress: "Do you know what your dress says?" The answer was a kind but apologetic, "No, sorry." Not ready to give up so easily, and sensing that there was at least a glimmer of interest in my query, I asked if the dress were a gift. She answered that her grandmother had given it to her. Realizing that a grandmother may be present at an event such as this, I inquired as to whether her grandmother was present. She was. Through an interpreter, I discovered that the dress did in fact tell a story—a proverb, if you will. Loosely translated it said: "At nighttime, just before bed, as I stand at the foot of my bed and look up, I see the moon; and when I look down, I see myself, inside myself, my life." In this simple message written on a dress, translated for me by a wise grandmother, is in fact the reason why grandparents and special friends are so important. Moms and dads are often extremely busy with the present—making ends meet, getting though each busy day—dealing with the pragmatics of raising children. Grandparents though, a little removed from the day-to-day, and a little wiser having seen so much of life, are often the ones who take the time to help our children look up to see the moon and the stars, to hold onto that awe, the wonder of childhood for as long as possible; and who, because of their objectivity, knowledge and experience, can help a child find, or in some cases remember, who they are. 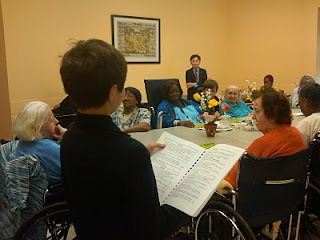 "The good" can be found here, in interactions and connections between the generations. 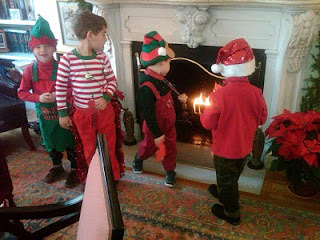 This is why we have Gandparents and Special Friends Day at Saint David's. 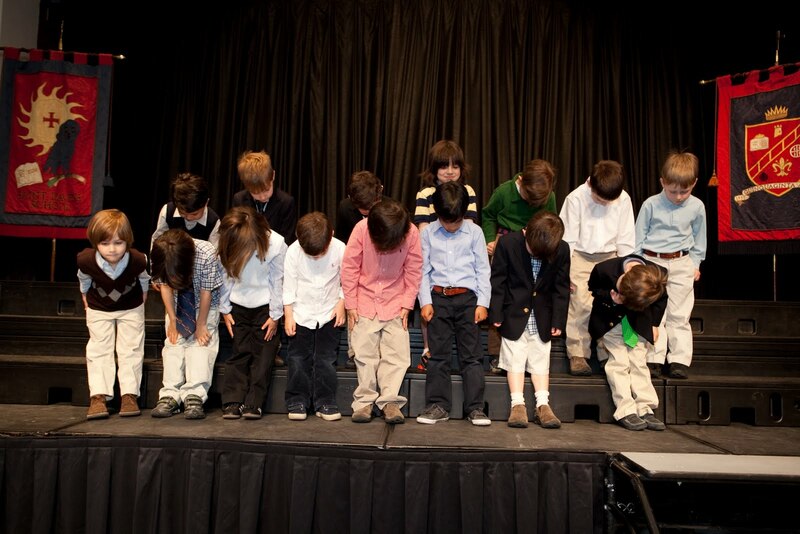 The photo attached: PK taking a bow after a rather moving performance. 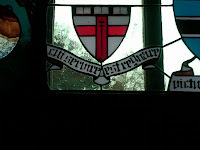 ... joined the boys of Saint David's for a morning gathering of music making April 29th. It was a delight to see the boys perform, with such gusto and confidence, especially the theme song to Mission Impossible. Mr. Hough proudly conducted the ensemble. The girls were wonderful guests and talented musicians. It was a focused social with a purpose--playing music together! Thank you, girls. The habit most associated with charity as a virtue—generosity—is the giving freely of time, talent, skill, or resources without the expectation of something in return. It’s a noble notion, literally. The etymology of the word, from the Latin root, literally means “kin” or “clan.” The earliest usage of the word reflected an aristocratic sense of being of noble lineage or “high birth.” Over time the meaning changed. Generosity began to identify a nobility of spirit, rather than family heritage; to signify character traits and actions associated with the ideals of actual nobility such as gallantry, courage, strength, gentleness, and fairness. Today, the meaning of “generous” has changed further to mean munificence, open-handedness, and the liberal giving of money and possessions. Over the course of centuries, the meaning of generous has shifted from an ascribed status restricted purely to the “nobility,” that was either truly earned or not, to be an achieved status of admirable personal quality and action, that is achievable, although not easily, by anyone*. As I continue to reflect on our school’s theme for the year this word generous surfaces often. I like the democratization of the word’s meaning over time. It is no longer given by right; but truly earned by actions and behavior, by habit. But it has to be achieved. To achieve, to earn something takes effort, work. Work is hard. 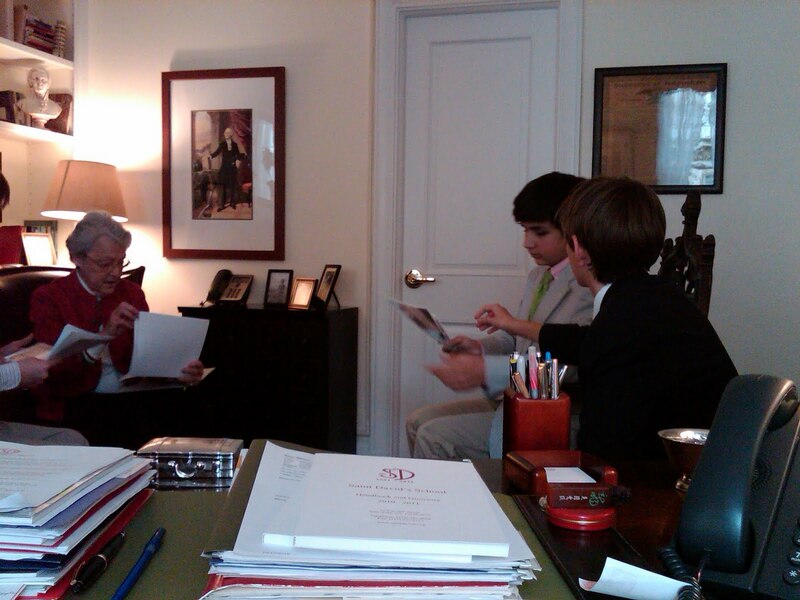 Today, I escorted sixth grade boys, members of the Headmaster’s Service Club, on their final visit to Cardinal Cooke. They played trivia bingo and conversed, and shared stories with the residents. They worked hard. 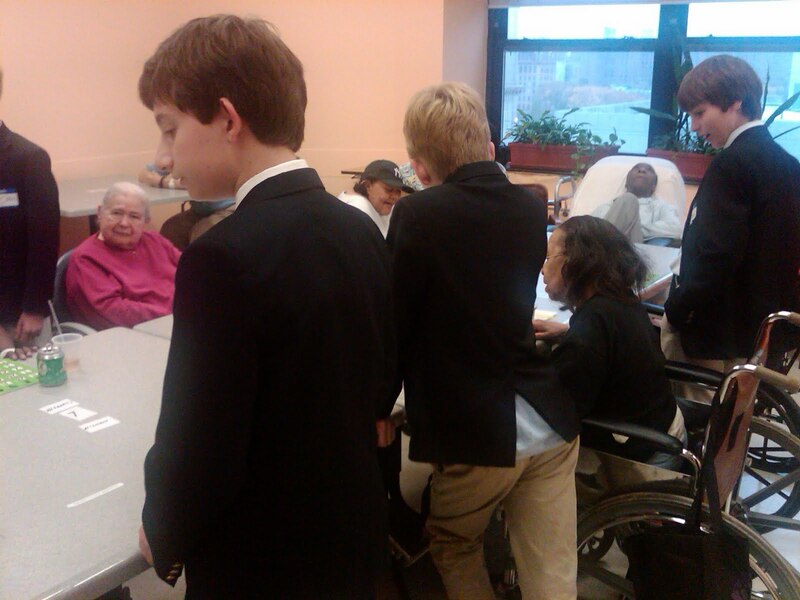 The boys gave freely of their time to visit with the old, the sick and the infirm. They exercised patience, kindness, gentleness, and a selflessness--all in the late afternoon, after school had closed for the day. They have done this every month for a year. If part of “the good” can be found in the virtue “charity” by way of “generosity,” then the sixth grade volunteer members of the HM Service Club have found this part of "the good" for sure; and they achieved it the hard way. They worked for it. Thank you boys for your exceptional, generous and noble service to our extended community. We are all richer for it. * History of the usage of 'generosity,' in part, from Wikipedia. 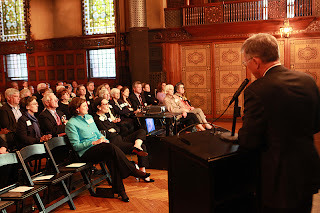 Inside the magnificent Veterans Room at the Park Avenue (7th Regiment) Armory Thursday evening last, Sam White presented a captivating talk on the life and work of his grandfather Stanford White. It was a fitting venue for this 4th annual social event organized by the Alumni Parents Council under the dedicated leadership of Dorothy Faux and Linda Foran. 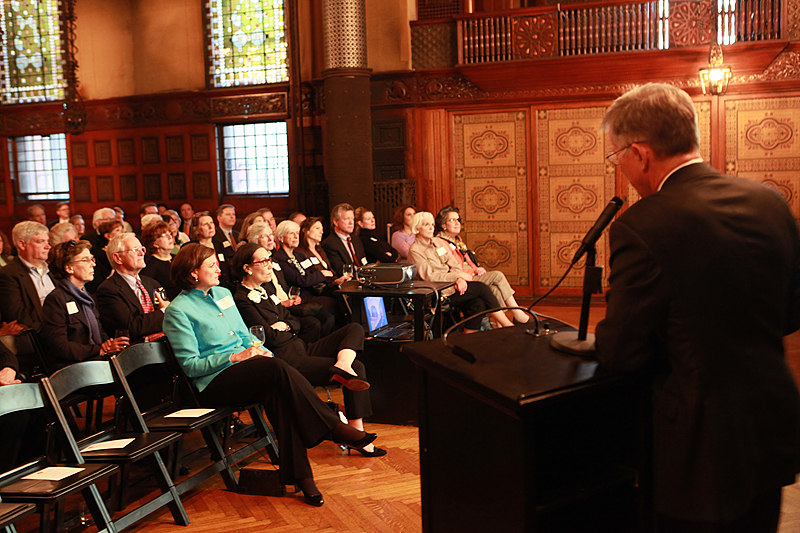 With more than 100 people in attendance, Sam not only explained in detail the room we were occupying, designed by his late great grandfather, but also walked us through his great grandfather's life's work--the Farragut Monument, Villard House, Payne Whitney House, Church of the Ascension, Newport Casino Theatre, Metropolitan Club, Madison Square Garden, Prison Ship Martyrs Monument, The Century Association, Herald Building, NYU's Guild Library, Tiffany and Co., NY, to name a few. The Seventh Regiment was known most famously for its service during the Civil War. Its Armory is an incredibly interesting New York City landmark. Within it, the Veterans Room, designed by White and his firm in the late 1870s-early 1880s, has been described as "Greek, Moresque, and Celtic, with a dash of Egyptian, Persian, and Japanese." The Veterans Room and adjacent Library capture White's distinctive style and the Regiments unique character. An architect that incorporated an eclectic array of media and style, White is credited with an American architectual movement. His life, as Sam states in his book, was "extravagant" and his death "sensational," tragic. At the height of Stanford White's influence and impact, an assassin's bullet took his life. Sam, an alum from the class of 1960 is one of five brothers that graduated from Saint David's in the late '50s through early '60s. Sam and his wife, Elizabeth, co-authored the book Stanford White: Architect. 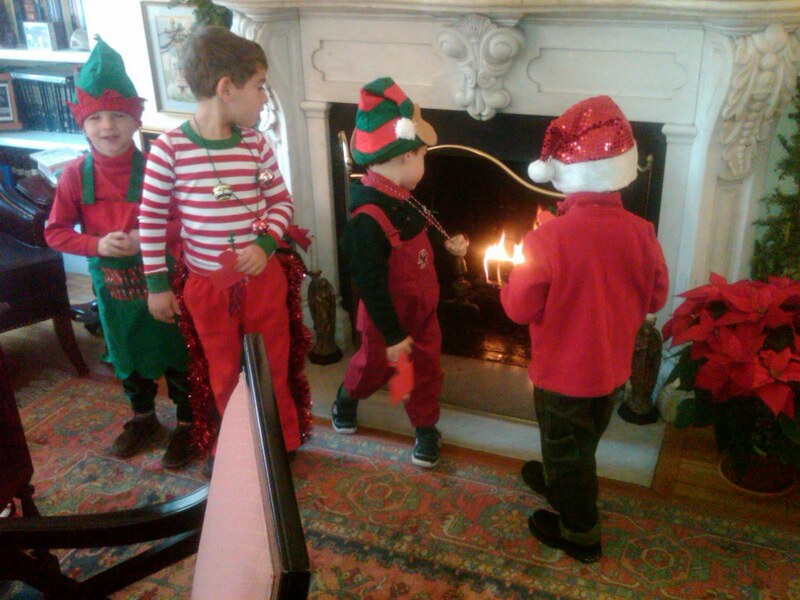 The Council hosts several events each year aimed at bringing the extended Saint David's community together. Listening to the incredible story of Stanford White as told by his great grandson inside the room he designed at a defining time in American Architectural and cultural history was a classic New York Moment. In my opening remarks that evening welcoming Sam, I quoted his headmaster, Mr. Hume, "Sam was one of our earliest graduates to go on to such incredible success." That success was truly evident this night.